For most people Valentine's Day is dedicated to celebrating love. I'm single so I don't have that kind of love in my life right now. I spent my Valentine's Day at the mall getting "Brick and Mortar" freebies. "Brick and Mortar" freebies means getting freebies in person at a store. In my previous posts, I've written a lot about freebies I've received in the mail. In this post, I'm going to focus on freebies I received by personally visiting stores. 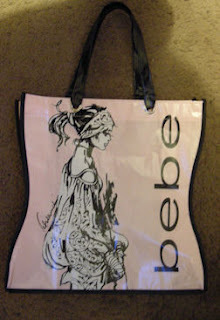 I found out Bebe (@bebe_Stores on Twitter) was giving away a free tote designed by Barbara Hulanicki in their stores from February 12th to February 15th. All I had to do was print the picture from their Facebook fan page and show it to a Bebe employee. I was a bit nervous because the promotion started on February 12th and I wasn't sure if there would be some totes left on February 14th. Fortunately, I was able to get a tote. It's not flimsy and it's a great size. I love that the tote is able to stand up by itself. After getting my tote, I visited the Bare Escentuals boutique. 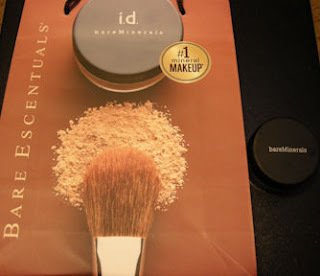 Bare Escentuals focuses on mineral make up. They are currently holding a sweepstakes online called "Rethink What Matters." Each week they give away a different beauty product to a few lucky winners. On January 30th, I won my choice of either a blush or all over face powder. I decided to get an all over face powder because it sounded like a product I would use more often than a blush. After a brief consultation with a Bare Escentuals employee, I got an all over face powder called "Pure Radiance." The retail value of the powder is $18.00. Aveda is a very generous store. I've received a lot of samples from them by signing up for their mailing list on their website. A few days ago I got a postcard in the mail telling me to get a sample of their new hair product. An Aveda employee asked me questions about my hair and then recommended I try the "light|elements shaping wax." I got a cute little jar with a decent amount of wax to try on my hair. It's too bad phase two of the Twist Txt Get promotion by Coke is over. I won so many movie tickets and $25.00 gift cards from that Instant Win Game. I used two $25.00 gift cards to buy two $25.00 Sephora gift cards. I also redeemed the movie tickets I won and used them to watch Dear John which stars one of my favorite actors Channing Tatum (@channingtatum on Twitter). Although I didn't have a boyfriend to spend Valentine's Day with, having the opportunity to get so many wonderful freebies made up for being single.